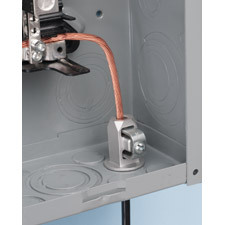 Arlington’s Grounding Electrode Connectors provide excellent strain relief – and install from inside or outside a metal panel through an existing knockout. Listed for stranded/solid copper and aluminum, these TWO connectors cover the entire range, from #8 to 3/0 conductors. Now stock just TWO instead of seven different connectors at half the cost of other Listed connectors on the market.